Gunfighters of yore would shoot from the hip with their eyes firmly fixed on the target. They must have spent countless hours in their youth practicing the hand eye coordination necessary for this feat. Come to think about it, most of them were still in their youth when their short careers were ended. Handgun sights were rudimentary, at best, and instinct naturally directs the eyes toward a threat. Gunfights were close encounters, and the time to visually acquire a sight picture may have been a deadly luxury. Nonetheless, in a showdown with Dave Tutts, after Dave's first shot missed, Wild Bill Hickock used a lightening fast, but deliberate, two hand hold to shoot his opponent through the heart at 75 yards. At any distance beyond arms length, an optical aid, even if it's only the front sight, should be employed. It is recommended that the front sight on a powerful, wilderness defense revolver be replaced with an oversize, tritium gas or self luminous dot, built into the top of the front blade. One manufacturer guarantees the sight system for twelve years. Optionally, two more tritium dots on the rear sight will fit a defensive handgun for city use. If there is enough time, and you have the discipline to employ the sights, the three dots can be lined up quickly during the day, and they remain visible as green, orange, or a combination as the light fades into total darkness. Night sights are highly recommended on a defensive firearm. Most attacks may occur in low light, and the tritium dots glow in the dark without batteries. Note the small bulge of the laser grip below the slide serrations. An Express front sight, like the AO Sight Systems Big Dot Tritium Pro Express seen above, is an improvement over the smaller dot of standard front sights. A dovetail may need to be cut into the front of the slide for installation, but it is more secure than other sight attachments. At the expense of target tight groups, the larger front sight gives a faster visual reference in an emergency situation. However, the eyes will probably fixate on a sudden threat and not be able to see any sights at all beyond the narrow cone of vision that results from a terrified survival instinct. Therefore, some training should be done with the eyes focused solely on the threat. In less than bright conditions, a laser sight system will project a beam resulting in a clearly visible dot on the target. A switch to enable battery power and a pressure pad to activate the beam require extra manipulation and care that the batteries don't discharge. In a dusty or smoky atmosphere, the beam is a dead giveaway, but once the dot is placed on the target, other intimidation would be superfluous. The laser is best suited as an aid to unloaded practice, so windage and elevation adjustments should be made to correspond with the fixed sights at seven yards or less. Not only does the dot show where the gun points, but also it unnervingly reveals the slightest tremor, much like a high power scope does for the rifleman. As long as the dot describes smaller and tighter circles as one practices the hold and trigger press, with experimentation and patience, the shooter can gain confidence in his or her technique. It is recommended that the master switch on the laser be kept in the off position for street use. In changing light conditions, it will be a time consuming distraction if one must hunt for the dot. A laser makes a lot of sense to practice the hold, the dry fire, and the handgun use from defensive cover in a safe room when an adversary is trying to break through the door. Don't let the laser give you a false sense of skill or ability. The fundamentals of proper hold and trigger technique are as important as ever, even when the laser dot appears to be spot on before the shot. Other than for defensive use, active lasers are generally not legal for hunting. Red dot sights are available in a variety of tube diameters. A passive red dot sight system is legal for hunting, and many competition shooters employ it with both eyes open. Like the laser, it operates on battery power. 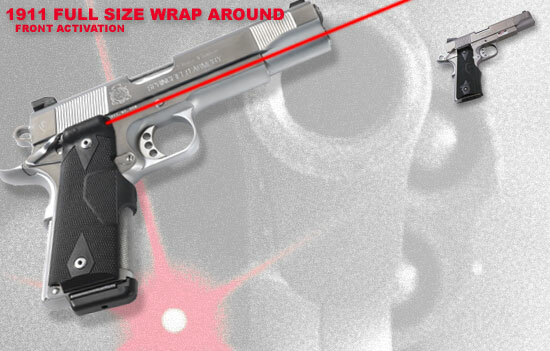 The red dot differs in that it can be seen only by the shooter, and its brightness can be adjusted. After mounting the scope-like body of the red dot and adjusting it for windage and elevation, its dot will seem to be superimposed on the target, and it will be accurate no matter how close the shooter's eye is to the lens, or how centered. In other words, there is no error for eye relief or parallax. The eye can only focus on one thing at a time. The advantage to red dot systems and scopes is that the aiming device and target are placed on the same focal plane together and can be seen sharply at the same time. When using iron sights, the eye must perform a focusing exercise between the rear sight, the front sight, and the target. Of the three, the front sight is the most important for ultimate visual confirmation. The master eye is naturally more agile at changing focus, so to use the weak eye instead will require that the master eye be closed, avoiding confusion. Determine the master eye by pointing at an object across the room with both eyes open. Close one eye. If the finger point remains centered on the object, the open eye is the dominant one. Shooting with both eyes open is preferred. Practice bringing a weapon up to the eye sight level until the motion and fit seem natural and comfortable, then try again with both eyes closed. When the eyes are opened, note the relative position of the body to the sight line, and adjust the stance to take advantage of the natural point of aim. Now the rear sight will be easy to see through quickly. Focus on the front sight. The eye will try to center and level out the sights for proper sight alignment, then put them on the target, for a proper sight picture. The target will be slightly blurred as the focus should concentrate again on the front sight prior to the shot. A long sight radius, or distance between the front and rear sights, makes for more precise sight alignment and accuracy. Holding a handgun out and away from the eye helps form a finer sight picture, especially if the front sight nearly fills the notch in the rear sight. A receiver sight, or peep sight, takes advantage of the combined length of barrel and receiver for the longest sight radius. The size of the hole in the rear sight can be changed from a small, target aperture to a large, ghost ring for fast acquisition in low ambient light. Since the eye will naturally center any object through a hole, it only needs to focus on the front sight while placing it on the target. As the eyes grow older, they loose the ability to focus on close objects such as the front sight of a rifle or handgun. However, when they look through a small pinhole, everything, near and far, becomes clear. That's why Grandpa squints while he looks for his glasses. This is the same principle photographers use to get a large depth of focused field. They close the camera lens aperture to a small hole. The problem is that there may not be enough light to work with. In a sudden, close range, defensive use of the handgun, practice and good equipment can overcome a lack of light. Professional hunters in Africa prefer dependable, fool proof iron sights for close range protection. Medium range automatic rifles might sport mid power, self luminous aiming point scopes. But for long range or a small target, nothing beats a good high power scope. Light enters the objective lens of a scope, is magnified and corrected, then leaves the back eyepiece as a small beam called the exit pupil. Hold a scope at arms length, and the exit pupil can be seen in the eyepiece. The beam of light enters the pupil of the eye, which may be quite small in bright sunlight, or more than 5 mm in diameter at night. If the exit pupil is larger than the pupil of the eye, the extra light is wasted with no harm done. If smaller, the eye will be frustrated trying to center itself in the small beam. The exit pupil is the diameter of the objective lens divided by the magnification power. With a 40mm objective, a 10 power scope will have a 4mm exit pupil, which should be enough except in very low light. A 50mm objective would be better, but the fatter lens is heavier, and it has to be mounted higher off the axis of the bore, which is a compromise. Lower power scopes have ample exit pupil for any condition, but the 20 power target scopes are difficult to use at night. Unless you have a good supply of band aids, please avoid lifting the head or getting close to the recoiling eyepiece mounted on a magnum powered rifle. To judge the quality of a scope, rely on the manufacturer's reputation and warranty. Scopes have to remain sealed against moisture or fogging from temperature changes. The lens and mechanism can't loosen from the shocks. The reticule, or crosshair, needs to resist recoil and stay accurate after repeated adjustments and power changes. The duplex crosshair, fat on the outside and thin in the center, has been useful and popular. For long range flexibility, the mil dot system, or an evolution of it, is preferred. The brightness and clarity or resolution of precisely ground, aligned, and coated lenses can be seen using side by side scope comparisons. Use the best lens covers, cleaning supplies, and technique to keep from scratching the lens. The less expensive optics have become much better, and the best optics have become very expensive. Non-magnifying optics on serious rifles provide the Operator with significant advantages over iron sights. Of that there is little doubt. The elimination of the need for wearisome maintenance of the alignment of front and rear sights with the shooter's eye is the main selling point for rod-dots. The aiming point (dot) needn't be in the exact center of the rear lens. Even when it is near the edge, it is still on target, and this represents a genuine advantage, because the Operator's head and face don't have to be positioned precisely behind the rear sight, a substantial benefit when shooting from awkward positions. The other main feature of optics is the ability of the Operator to see, while looking through his optic, downrange detail that is under the aiming point. With most iron sights, such detail is blocked out. For competent fighting, my preference is Aimpoint's T1 or H1 (on LaRue mounts), mounted well forward and away from the Operator's eye. Aimpoints are not eye-relief critical, and can therefore be mounted anywhere on the top rail. The T1 and H1 are both exceptionally compact and non-magnifying. However, many police executives insist on magnifying optics, because they want to see downrange detail, detail that is important to report-writers, less important to active combatants! Most good scout-scopes are 2.5x or less, are also not eye-relief critical, and can thus be forward-mounted. They too represent a good choice for serious rifles. Magnification beyond 2.5x requires close eye-relief and is not recommended. Close-eye relief optics make it difficult for the Operator to see around the scope, so the scope becomes his whole world. This may suffice when someone else is watching your back, but not a good idea when you're operating alone! Another issue with high-magnification optics is the constant temptation to analyze the downrange situation through the scope. Big-game hunters do this all the time. However, we must remember that, in doing so, you're necessarily and deliberately pointing your gun in the direction of what may be innocent people. 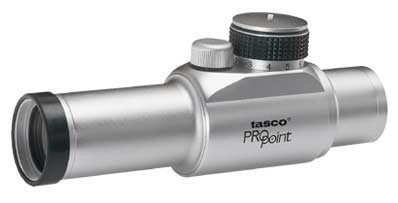 High-magnification optics, in my opinion, are well suited for hunting non-dangerous game at extended ranges. When fighting for one's life, for reasons enumerated in the foregoing, they represent a poor choice! For fighting rifles, non-magnifying rod-dots are the way to go. "Last week, I ran into an issue with my red-dot-equipped AR. At 100m, I routinely hit an eight-inch disk, dead center. When a friend shot the same rifle, with no change in aiming point, he routinely shot four inches left of center. When I again shot the same rifle less than a minute later, with no aiming-point nor sight adjustment, my shots were, once more, dead on." I have no idea what caused this variation between my friend and me!" Parallax is the apparent displacement of an observed object due to lenses and distances. The effect is that an object being observed through the optic is not exactly where you see it. The degree of displacement, through the same optic, varies, sometimes considerably, from person to person, as you experienced. All red-dots, indeed all optical sights, have parallax, regardless of advertising claims to the contrary. High-quality red-dots have a minimal amount, but it is still there. With Aimpoints, for example, parallax can displace as much as one inch at 100m. Since Aimpoint's illuminated reticle is either 2 MOA (two-inch dot at 100m) or 4 MOA (four-inch dot at 100m), the average shooter will experience no meaningful parallax. Most utility/battle ARs are capable of 2 MOA (minutes of angle) accuracy. Most AKs are capable of 4 MOA. Most military ammunition is, at best, capable of only 3 MOA. So, you have a 2 MOA rifle, shooting 3 MOA ammunition. Thus, at 100m, a four-inch group from your rifle, with any kind of sighting device, is very respectable! With shortness of breath, awkward firing positions, and time-pressure, groups will invariably open up! Unfortunately, the naive expect 1 MOA accuracy from utility/battle rifles, because of articles they're read in "Gun Lust" magazine. A military rifle capable of that would be so tight and temperamental, it would be unsuitable for any practical purpose anyway. Parallax is fundamentally incurable, so we learn to live with it, just as we learn to live with other limitations in our equipment, and in ourselves!" Comment: Rifles are invariably individualized. Once yours is set up to your liking, someone else, when shooting it, may find no joy! Rifles, thus, should probably not be shared. When they are, expect issues! "Police need to be able to distinguish details at distances that exceed 100m! A non-magnifying red-dot just cannot provide us with the critical information we need, any more than can iron sights. Options we like include the pivot LaRue mount, with either an Eotech, AimPoint, or other swing-out magnifier that provides magnification when needed, and is out-of-the-way when not. Of course, one inherits some bulk, but we are convinced it is a small price to pay. And, the excellent 1x4 Elcan Specter, that is both a CQB optic, and (with a throw of a lever), a 4x optic with exceptional clarity. And, the Millet 1x4 DMS-1. I have used all these extensively, and they work extremely well for our purposes. Elcan is expensive but features superior glass and clarity. Millet is low cost by comparison, but still very usable. Add-on magnifiers and mounts will cost as much as the red-dot itself, and you inherit four lenses to keep clean, instead of just two, but, in modern law enforcement, we can't live without magnification!" Comment: "Where you stand depends on where you sit!" There are many options to suit many circumstances. All combine wonderful advantages with annoying handicaps! You can't acquire any desired "feature" without inheriting nettlesome disadvantages. As always, my friend has courageously confronted his challenges in a most innovative way. He speaks from experience, and the equipment he describes is all top-drawer. He is too! "When shooting with a red-dot, I never have to change the focus of my eyes. In my opinion, that is their best feature! My eyes watch my threat the whole time, which is what they naturally want to focus on anyway. When the dot overlays the place I want bullets to strike, I press-off shots! One of the hardest things about shooting a threat that is close and is trying to hurt you, is shifting your gaze from the threat and re-focusing on your front sight. Red-dots eliminate that requirement! In McBride's book about WWI, 'A Rifleman Went to War,' he describes his perfect (then theoretical) rifle sight for quick shooting under exigent circumstances, and it's basically an Aimpoint T1 that he's depicting. In view of the foregoing, like you, I've concluded that the T1 is what I want on my serious rifles!" "Regardless of the Operator's age, red-dots provide a significant advantage over iron sights, as well as traditional etched-reticle optics, particularly in low light. The vast majority of military engagements are inside of 300m. The addition of Aimpoint's 3x, swing-out magnifier easily meets just about all magnification/identification requirements." "This past weekend, at the ACTS Combat Rifle Championship, the overall winner (a Marine) used iron sights. This young trooper bested a field sprinkled with red-dots, intense magnification, compensators, lasers, and whiz-bang triggers. Sharp eyes and a good neural connection between brain and trigger-finger, lots of practice/experience, and a winning mindset can easily overcome a host of do-dads screwed to rifles. Of course, this kid has the eyes of an eagle! Conversely, those of us in the 'bi-focal stage of life' may just benefit from high-quality optics, eh?" "While red-dots surely offer distinct advantages, one still has to shoot well! When one has not yet figured out the difference between (1) 'shooting things' at (2) 'shooting at things,' the addition of modern optical sighting systems will still represent an exercise in futility! It could be said that we're forgotten that a consistent, repeatable hold on the rifle will cause a consistent, repeatable gun/shooter response to recoil, and thus a consistent flight of the bullet! Optics are now sometimes mounted so high that any type of cheek-weld is impossible, and many Nimrods seldom even think about consistency in grip, nor in getting centered behind the sight. No wonder they can't hit anything! Red-dots and magnified optics are still just a 'sight.' Again, it all comes back to the basics, lest we forget!" I have a number of serious rifles equipped with Aimpoint T1/H1s, EOTechs, Zeiss Z-Points, and Leopold scout-scopes, as well as iron sights. I don't yet have a swing-out magnifier for my Aimpoints, but I soon may. I'm developing personal preferences, but my personal likes and dislikes are not important. All the above comments are valid and need to be carefully considered. about all of them, and do! However, in our current Age of Excitement, all of us had better be working on our rifle skills as if our lives depended upon it! We all need to get "set-up" and then get as many rounds downrange, as often as we can, making honest changes/upgrades as necessary. Sighting systems will continue to evolve, and we all need to continue to seek out every advantage we can. Since the probability of something going wrong increases as ambient light decreases, a handy lighting tool can be indispensable. There may be occasions to need one during the day, as well. Light for navigating should be even and diffuse. Light for identifying a threat should be focused. And light to incapacitate the eyesight of an assailant should be powerful. The device needs to be small and light if it will be carried constantly. The body should be rugged, the grip should be positive, and the switch should be accessible from any position. Mounting a light on a long gun may be necessary, but keeping it separate from a handgun gives you more flexibility. Lumens are used to describe the total amount of light coming from a source. Candle power refers to the intensity in the beam. Lumens tell you how powerful the device is, and candlepower tells you how tightly the beam is focused. Identical lights produce the same lumens, but their beams could produce different candle powers due to focusing. With 10 lumens of light, most tasks can be done. The early English unit of foot-candle was defined as the illuminance on a surface placed one foot from the standard candle. 100 foot-candles is generally considered enough light to perform most tasks. These terms help compare illumination tools but not their usefulness. A light can have candlepower at one point in its pattern, while the rest of the pattern may be weak, uneven, and distracting. The eye is more affected by warmer colored light, and pulsing or flashing the light intensifies its ability to disorient. I have used the Surefire G2 with the 5 watt, 120 lumen Xenon bulb. For several years it has been the standard by which I have compared other lights. In the past, the Xenon bulb was best, but run time was limited due to high power consumption. For example, my G2 Surefire with the optional 5 watt 120 lumen bulb runs 20 minutes on two expensive 123 lithium camera batteries. The heat generated could literally start a fire. Next came the Luxeon LED flashlights that ran longer but weren't quite as powerful. Now a new, powerful surface mount LED is here that runs cool at affordable prices. Here's a great pocket light with strobe, high, and low settings for $69 that uses one rechargeable RCR123 battery. At $260, this is the brightest light I have. Use four slightly longer protected circuit 18650 batteries. "Can A Flashlight be worth $200.00? I just returned from Amsterdam, and I have pertinent thoughts on this subject. I was looking for Gate Five. A couple indicated they were looking for Gate Six, so we set off together. Before long, I looked like the Pied Piper! In this environment, having the ability the dial down the intensity of the light turned out to be an extremely valuable feature. I was able to 'reduce the volume' and subsequently divest myself of some unwanted attention. Truly a versatile tool! While in Amsterdam, I stayed in a hotel two blocks from their famous Red-Light District, and I had to walk through part of it every day in order to get to the train station. I was approached numerous times by young men with their hands in their pockets. It quickly became obvious that they were selling drugs. When they closed to within four meters, I learned to hold up a hand and shake my head. It almost always worked. They would disengage and abruptly veer off, looking for more promising pickings. However, one afternoon things took a sinister turn. I was approached by a disheveled man in his forties. I performed my now-customary disengagement routine, but it didn't work. He kept coming toward me, saying (in English) that he was trying to find the train station. I replied that I couldn't help and tried to flank him. He again stepped in my path, this time saying that he needed money and that he was really a 'good guy,' to my mind, confirming the opposite! I already had my Gladius in my hand. I set it to 'strobe,'and aimed it directly at his face. The results were instant and startling! He immediately became disoriented and started teetering in place. He then covered his face and rapidly turned away, immediately walking right into a wall, knocking himself backward. He fell to the ground, flailing, altogether befogged. I quickly walked around him and continued on my way. I never saw him again. So, to return to the question, can a flashlight be worth $200.00? It surely was that day!" Comment: Like my friend, I carry a Gladius also. The strobe feature makes it an effective, non-lethal weapon, a weapon you can take with you on commercial aircraft! 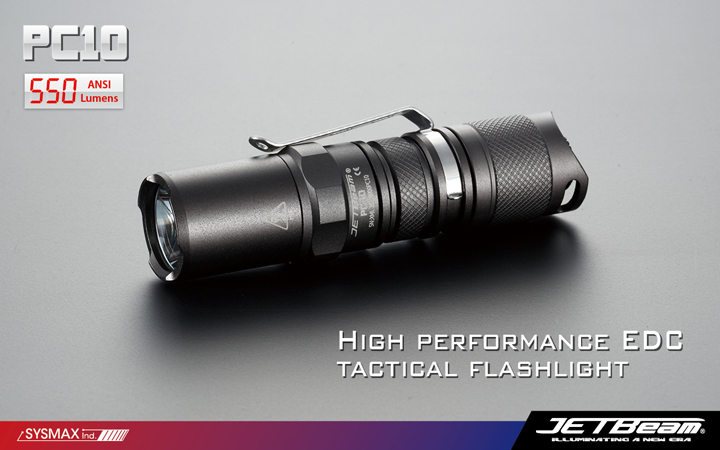 Blackhawk has confirmed that some early Gladius flashlights were produced with defective endcaps. Current production is fine. If you suspect you have a defective unit, get hold of them, and they will fix it promptly. Blackhawk's customer service is excellent.